A man "wakes up" on a train with a beautiful girl in front of him who is definitely showing she knows him but he has not any idea what is actually happening. More than that, the man thinks he should be piloting an army helicopter in Afghanistan at this moment instead of sitting in a train with a woman claiming she recognizes him. If this sounds interesting, it will become even more intriguing after a while in case you are going to watch Source Code. 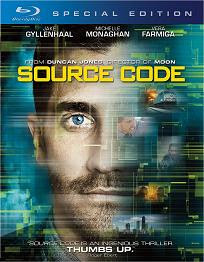 Source Code is the second full feature of director Duncan Jones and it has a lot of similarities to his first effort Moon. The movie is in the vein of the sci-fi genre again and it is based on a pattern of repetitiveness. Captain Colter Stevens (Jake Gyllenhaal) somehow gets on that train and discovers step by step that he has the strangest rescue mission. Christina Warren (Michelle Monaghan) is a woman sitting opposite captain Stevens on the same train and showing interest in him for whatever reason. Suddenly the train explodes. But this is just the beginning of the story for Colter Stevens and a bunch of people in a military-scientific research center. Source Code is cyclic but not boring. We see consecutive repetitions of a couple of scenes but each subsequent iteration presents lots of new stuff and adds considerably to the development of the story. The narrative keeps to be intriguing during the majority of the movie and although it does not offer any real twists, the audience is keen to understand what exactly and eventually how it will happen. Given the sci-fi nature of the film it is hard to say whether the "how" question is satisfactory answered or not. But this is pretty much the case with every sci-fi movie exploring more complicated concepts. The acting in Source Code is Ok. Jake Gyllenhaal manages to develop his character from a-near-mess guy in the beginning to a charming and self-confident man towards the end of the movie. Michelle Monaghan plays her part of the repetitive game with ease and she is as beautiful as usual. Vera Farmiga and Jeffrey Wright give authentic performances of troubled assistant Colleen Goodwin and purposeful Dr. Rutledge correspondingly. The rest of the Source Code's cast is also convincing. The writing is quite good especially having in mind the limitations of the film's premise. And Duncan Jones proves to be a director who seems to possess potential of making some great motion pictures in the future. The movie has some imperfections though but nothing significant. One could start with its title, Source Code, which might not be the perfect match and reach to its ending that is predictable and probably excessively happy. Throughout the film there are several elements that are hard to be understood, e.g., why captain Stevens retains his own appearance during the train sequences. The whole concept of Source Code is sufficiently confusing too if you try to get deeper into it. But since it is a sci-fi movie a bit of confusion is always excusable and the rest of the flaws are readily forgivable due to the overall entertainment and involvement the film offers. If you are into science fiction thrillers or you've liked the previous Duncan Jones' movie Moon, Source Code should be an easy choice for you.